Well there’s something you don’t see every day… Ghostbusters Playing Cards pay homage to the greatest supernatural comedy of all time. With rich illustrations that capture the essence of important characters of the movie, this deck of cards is the next best thing to a real-life proton pack. 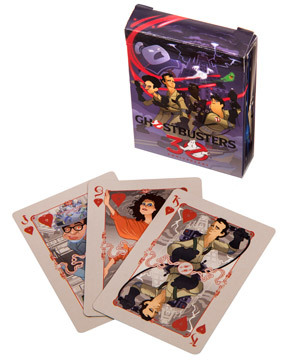 Each face card features artwork of a different character, from the Ghostbusters themselves to Janine, Peck, and Louis, to everyone’s favorite spooks. If you’re not excited about the custom jokers, superbly detailed box and back-of-card designs, and air-cushion finish of this deck, you can just return forthwith to your place of origin or to the nearest convenient parallel dimension. Who ya gonna call (or fold)? We're big fans of playing cards that feature exquisite artwork from awesome movies. If you're in the market for a Ghostbusters-themed present, then in the words of Janine, "We got one!" The iconic "no ghosts" symbol, open containment traps, and proton packs with confinement streams capturing Slimer decorate the reverse of every card in the deck. Each of the face cards boasts a different character from the movie in a cartoonish style that perfectly captures their individual personalities. Also included are two terror dog themed jokers. 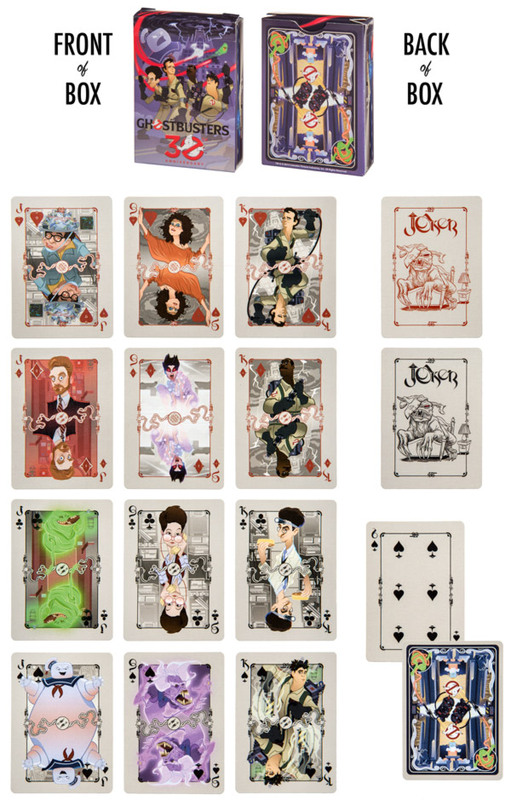 The deck's face cards feature detailed illustrations of characters from the movie.